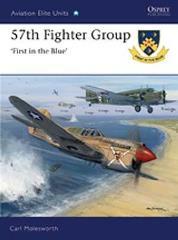 Organized in January 1941, just as the United States was building up military forces for its inevitable entry into World War II, the 57th Fighter Group was the first USAAF fighter unit to go into action in North Africa. It went on to establish a number of other firsts' during its illustrious combat history in this theatre. Flying P-40 Warhawks, the pilots of the 57th entered combat in August 1942 and fought throughout the final Allied advance from El Alamein through the Axis surrender in Tunisia, the capture of Sicily and the invasion of Italy. Converting to the P-47D Thunderbolt in late 1943, the 57th continued pounding the retreating Axis forces in Italy until the end of the war in Europe. The 57th Fighter Group produced a number of aces during the war, and was also recognized for its pioneering achievements in the fighter-bomber role.